And a lot of so-called liberals indulged in collective shouting yesterday after mobile wallet brand Paytm released an ad that hurt their guilty conscience. The ad showed a woman from upper middle class talking about how demonetisation stopped her from paying money to her maid, as she didn’t have ready cash. The character was going on and on with her rant when the maid interrupted her and asked her to stop making excuses and transfer money to her via Paytm. The upper middle class woman in the ad was shocked at this awareness and technology adoption by her maid. And that was the end of the ad, telling people to use Paytm if cash was not available. 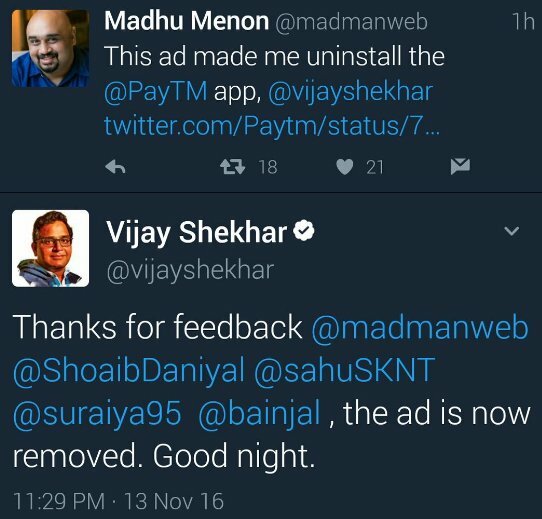 The ad upset some “liberals” so much that they uninstalled Paytm from their smartphones and tagged its founder Vijay Shekhar Sharma on Twitter, threatening that all of them will uninstall the application and thus hurt his business. Many of these outraged shouting virtue signalling liberals were from the media industry that has the power to hurt a brand’s image through biased reporting. Perhaps that led to Vijay Shekhar Sharma apologising and Paytm deleting the ad from its Twitter page. Paytm founder forced to apologise. Threat was dressed up as “feedback”. While economic boycott is a different matter, what is crucial here is to notice how the ad pricked the guilty conscience of the so-called liberals, who grouped up to launch a mob attack. But just as their threat was dressed up as “feedback”, their angst at being exposed was dressed up as “compassion”. Some of them claimed that the ad was patronising towards the maid. Really? Fact is that the ad showed a confident maid shutting her patronising employer up. Others said it mocked situation of people who were facing inconvenience due to demonetisation. No. It mocked those who were using the excuse of inconvenience to be lazy in general and unfair to maids in particular, so far as the ad’s copy was concerned. The truth is that the ad touched them where it hurts the most. Where a privileged class person arrogates the right to speak for the underprivileged class under the garb of activism. Where this class assumes that maids must be poor enough not to have a smartphone (even though some really cheap ones are available) and stupid enough not to know how to use apps (though maid’s husbands can be Uber drivers using an advanced app? A hint of sexism there? Poor women can’t use apps?). When a maid decides to speak for herself and comes up with a view that is not aligned with the ‘liberal’ stand, this privileged class is taken aback and is forced to shut up. This makes them angry. And this is what made them shout, uninstall the app, and tag the Paytm founder with their threats. The bunch that shouts ‘rising intolerance’ and ‘free speech’ on every possible occasion, successfully arm twisted a brand to take off their ad. But as it happens on Twitter, every shouting is met with counter shouting. People asked Paytm if they will wind up their business if enough shouting virtue signalling liberals told them that their business was a scam? No argument, no logic required? Finally good sense prevailed and Paytm brought back the ad with a minor modification; where the maid is being a bit more respectful to her employer by not terming her excuses as “drama”. Ah, that was another thing that hurt the guilty conscience of virtue signalling liberals. The drama by the elitist snobs of being considerate towards the unwashed masses. This is not for the first time when the so-called liberal crowd has forced brands to take off ads in the last couple of years, all while shouting that they were facing intolerance under the new regime. Earlier Pepsi was forced to delay release of its ad as some so-called liberals claimed it mocked FTII and JNU students. Havells was forced to take off an ad as people who can’t see beyond caste termed it casteist. And Yatra.com was attacked for an ad that had a character similar to JNU lout Kanhaiya Kumar. So much for creativity, free speech, tolerance, accommodation, and liberalism.